Only there were too many times to throw in for any sort of manageability. Since Excel has problems with times over 24:00 to begin with, I first threw out any adjusted Liberty Bell and St. Vrain times at or over 24 minutes. I threw out teams that couldn't complete their scoring without runners over 24 minutes. I threw out out-of-state teams from Liberty Bell (except Albuquerque Academy since they are also a SW region team). That gave me a merged meet of a manageable size for the girls. As you might have expected, there was still a massive number of ties in the scoring to break. This time I did manage a pseudo-randomization of the ties, so there is no systematic advantage to either race or any team. Still, the tie breakers are arbitrary and team scoring could go either way in every close situations. 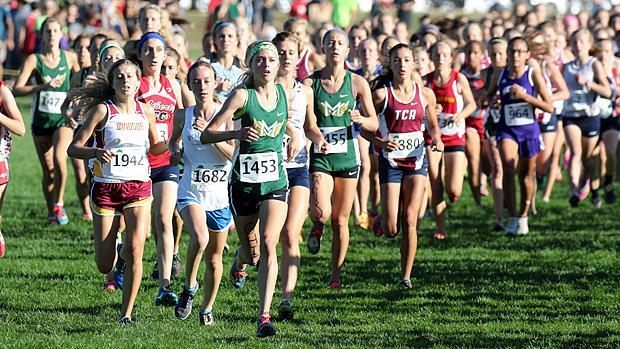 With all that as disclaimer, here's what you get when you merge a team score for the better teams from both Liberty Bell and St. Vrain from this past weekend. Mountain Vista prevails over Cherry Creek (and all other Liberty Bell teams), and by a surprisingly large margin. Does it mean Mountain Vista is a better team? No, not necessarily, but they probably did put together the best race of the weekend.